The Netherlands, 24 March 2015 – HAI strengthens its position in the dairy market by implementing its software at an infant nutrition plant. The HAI*QPM software is used to collect data from the production units, including product quality information. The result is a real-time plant information system. This information is used to improve the daily operations and performance of the plant. The Production Manager, is happy to get rid of paper based records for his operators, and have a real-time information system instead: “the information in HAI*QPM helps our operators and teamleaders to make quicker and more informed decisions, and facilitates a quick and thorough batch release and tracking & tracing”. 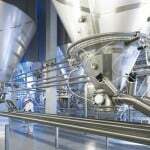 HAI*QPM is built to collect data from multiple production units and sources, which enables the company to have one overall information system for the whole plant, containing information about processing conditions in the Kitchen Process and the Spray Drying Tower together with quality test results of raw materials, intermediates and end products. Part of this project is to connect spray drying data analysis models to the HAI*QPM information system. By connecting these models, developed by NIZO food research (www.nizo.com), to HAI*QPM, opportunities for process improvement on the spray drying process can be identified. The HAI*QPM software is proven technology in the dairy world, and this is just one of the partnerships re-enforcing HAI’s position in the dairy industry.